We at Vol. 1 heard about Awkward Press and got all kinds of excited in knowing another group of people who are launching another fine looking indie press. All the info for their venture, and their upcoming party info is linked below. Awkward Press is a new publishing house dedicated to imagination, playfulness, and defying readers’ expectations. They will be celebrating the release of their first fiction collection, Awkward One, on Tuesday September 1st at Happy Ending, 302 Broome St., between 7:00 and 10:00 p.m. The first 40 attendees will receive a free EP from Super Mirage, the new supergroup featuring Kyle Jarrow from the Fabulous Entourage. The night will feature short, dramatic readings by Honor Rovai and Clay McLeod Chapman, as well as musical performances by Kyle Jarrow and Jeffrey D. As the evening progresses, a variety of surprises are planned, including an impromptu harp jam and a milk and cookie break. After the performances, a DJ will spin classic punk, new wave, indie rock and hip-hop. Admission is free and open to the public. Awkward Press is a bicoastal publishing enterprise that seeks to bring imaginative storytelling to a new generation of readers. It was founded by three young writers and performers from diverse backgrounds: Jeffrey Dinsmore, co-founder of indie noir publisher Contemporary Press and author of the novels Johnny Astronaut and I, an Actress: the Autobiography of Karen Jamey; Clay McLeod Chapman, creator of the notorious Pumpkin Pie Show reading series and author of the novel miss corpus; and Kyle Jarrow, OBIE Award winning playwright and composer and founder of New York cult legends The Fabulous Entourage. 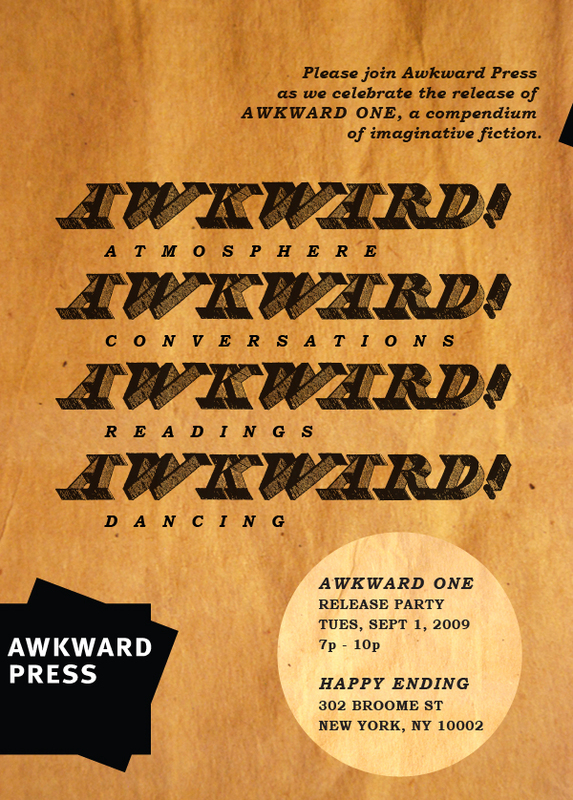 Awkward One, the first release from Awkward Press, is a compendium of five stories organized around the theme Awkward Occurrences. The collection features imaginative fiction by the three founders, as well as up-and-coming California authors Mike Cipra and Honor Rovai. In addition to their printed works, Awkward Press showcases new fiction, humorous essays, and mixed media pieces on their website, awkwardpress.com. Questions? Want to write a glowing profile about us? Contact us here or at info@awkwardpress.com.